Cesar Galindo has the best of both worlds. Having established an impressive resume, signature design style perfected over the years and dramatic couture creations for his eponymous label, Galindo can add his Czar by Cesar Galindo collection to his catalog. 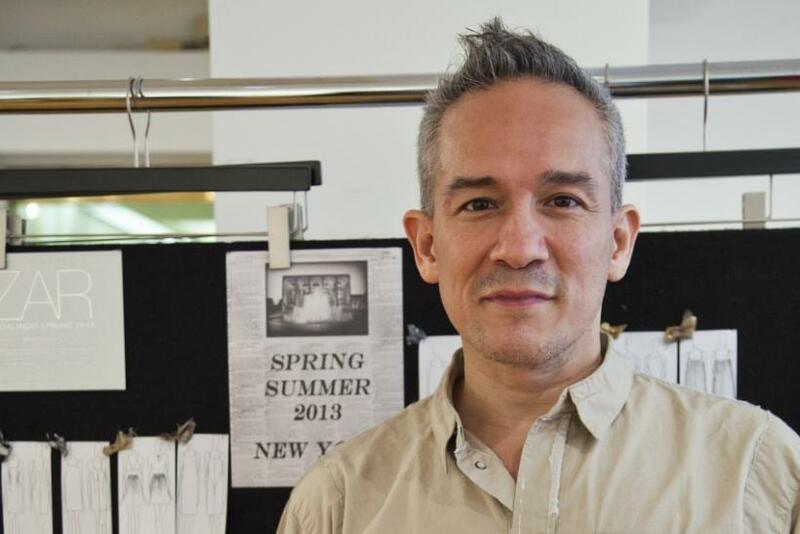 First introduced last fall, Czar will be shown at Mercedes-Benz Fashion Week in New York for the Spring 2013 season, displaying the fun side of his craft. "I've had a lot of fun doing [Czar]. It's a lot looser for me, in comparison to what I've done before," he said in his studio Wednesday, when he gave IBTimes a sneak peek of his contemporary line of party dresses and separates. The fact is that there are two sides to the Houston-born designer, evident in the juxtaposition of his collections. The Cesar Galindo couture label is structured in nature, inspired by 1920s Art Deco commanding drama best suited for red carpet occasions. "This is what I started out my business with," he said of his eponymous label. "It's a very glam. It's those things you want to put on and have a red carpet to walk out of your house." "We should actually sell the dress with a red carpet, so you can lay it out for yourself and walk across it," he muses. Czar by Cesar Galindo, on the other hand, is fun and flirty, with softy dresses and separates channeling a "Garden Party" vibe this season, with its colorful hues to match its vivacious aesthetic. "I call them muted brights," he said of his Czar collection. "That sounds like a contradiction, but I think that's where we're going. We're so used to the brights. Now it's taking that bright and toning it down a bit." The task that Galindo created for himself showing two completely opposite collections in one season was developing both lines and "dividing [his] brain in two." "They're two different mind-sets completely," he said. "It's actually probably been the most challenging part of my design career that I've ever had, doing it simultaneously." Best of all, Galindo has accepted the juggling challenge to cater to the dual nature of women in terms of comfort, as their preference for comfortable or striking changes on a daily basis. Galindo has much empathy for women and their fashion needs, which he has been fine-tuning for 22 years. Having worked as a contract designer for brands such as Dolce & Gabbana for nine years, Calvin Klein for seven seasons and Gwen Stefani's L.A.M.B. up until last season -- not to mention the slew of celebrities he's done work for -- Galindo has drawn from these "artist collaborations." The result has not been a springboard but rather the designer's ability to understand himself and his sartorial strengths. He became even more self-aware thanks to his two stints on reality television, which he called "a positive branding of who I am as a designer and as a person," not to mention a means for garnering fame. As part of Bravo's "The Fashion Show" in season two, Galindo competed for the victory against 11 others, but fell short of the win in the second-to-last episode in January 2011. "It was a very positive experience for me. It could have gone the other way though. As my career has unfolded, I think it has been a positive tool for me. To create a memory for somebody." And memories are exactly what Galindo uses to push forward, even techniques like the corsetry work he did during his first jobs at the Miami City Ballet and then the Houston Grand Opera. "The theatre for me as a first job ... expanded my mind on to how not to have so many limitations as far as design goes. I think in my work I was able to let loose more. It did open my mind more. I look back at it now and I appreciate it even more. " Another life event he looks back on is his time spent on Sundance's "All On The Line" with Joe Zee during its second season, almost a year after "The Fashion Show" aired. Thorough the help of Zee, the force and creative director behind "Elle," Galindo continued his evolution as a designer. "I think my experience with Joe Zee was an interesting one because we got to know each other," the designer confessed. "Joe Zee told me off-camera, 'You're the most challenging person I've ever had to deal with.' I took it as a compliment." But the real reality drawn from reality television for Galindo was his ability to take a step back and reflect upon who he is, despite the criticism which he believes is all part of artistry. "You have to take out of situations what you feel is going to help you and evolve you. I know my craft. I know my fabrics. I know my cut. I know what I'm doing. It's an art that you evolve with." Galindo believes that fashion, the forever-changing medium to communicate the intangible self-expression, is itself evolving with society. As the world, namely the U.S., moves out of the economic slump in 2009, Galindo affirms fashionable women need something as simple as color to recoil from the aftermath. "I think color is going to be consistently powerful. As long as we're moving out of a recession, you're still going to want to wear as much color as possible. I think it makes the world a happier place to be." And speaking of the economic future, Galindo has a plan for his own business, having already loosely planned its next move in his head: mass market retail expansion. "I want to create a global brand recognition and expanding your horizons with national retailers and big distributors. That way is the only way you grow and that's how you reach the masses. And I'd love to be able to reach the masses with an aesthetic that is mine." Specifically, Galindo's dream diffusion line would be to partner with Target, which over the years has seen the likes of Missoni, Zac Posen and the soon-to-be available Kirna Zabête for The Shops at Target. But Galindo doesn't want to be "just a flash in their marketplace," he said. The forever-blossoming designer ultimately wants to become "a staple brand that grows." "The idea is to create something there that's going to be a longevity, like they did with Mossimo and people like that. I think for us we want to create a sub-brand that's like a lifestyle brand within Target. That would be a total wish." Galindo, however, is by no means a dreamer when it comes to expanding his business. With just a little over a week until his collection hits the runway, that's not all he has in store; The designer is on the cusp of launching a line of accessories for Spring 2013, namely handbags which have been in the works for two months. "I'm very excited about it. I'm not going to show it unless I'm really happy with the product. But if it's right, it's going to go right to the show." With his spring collection having not yet even debuted at Mercedes-Benz Fashion Week, the forward-thinking Cesar Galindo -- with so many accomplishments under his belt -- is already on track to reflect for growth. "The whole idea here is to grow and at some point have it be an effortless experience in stress. As long as I've been doing it, this is all new again to me. You take the wisdom you have and you try to make it as smooth as possible."